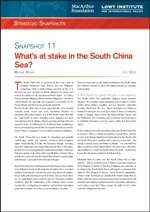 What at stake in the South China Sea? The territorial disputes in the South China Sea get much less attention than other crisis points, in the Taiwan Straits and the Korean Peninsula, but are arguably more unpredictable and dangerous. It is in the South China Sea that the components of Asia’s changing power dynamics are most concentrated and on display: China’s growing strategic heft and paranoid sense of entitlement; its Southeast Asian neighbours’ hopes and misgivings about China’s regional dominance; and the United States’ compulsion to meet China’s strategic challenge. In this Lowy Institute Snapshot, Michael Wesley examines the four reasons why finding solutions to the South China Sea disputes should be given the highest priority by strategic policy-makers. Current solutions on the table, usually invoked by multilateral mediation or international law are 'exacerbating' the situation and have no chance of working. Australia is well placed to play a significant role in proposing and brokering a solution. The South China Sea is enclosed by the west coast of mainland Southeast Asia, Borneo and the Philippine archipelago. Rich in hydrocarbons and fish stocks, it is traversed by over one-third of global shipping. Its waters and seabed are subject to six opposing territorial claims – by China, Taiwan, Vietnam, Malaysia, Brunei and the Philippines – but these confrontations are generally not regarded as seriously as the Taiwan Straits and the Korean peninsula standoffs. But the South China Sea is more unpredictable, and certainly warrants much closer and more sustained attention by strategists and policy-makers. It is in the South China Sea that the components of Asia’s changing power dynamics are most concentrated and on display: China’s growing strategic heft and paranoid sense of entitlement; its Southeast Asian neighbours’ hopes and misgivings about China’s regional dominance; and the United States’ compulsion to meet China’s strategic challenge. The South China Sea is a tangle of competing and mutually complicating claims over territory, resources and navigation rights. Geopolitically, it is like the Bermuda triangle, reversing expected alignments and suspending normal rules of the game. It pits Asia’s two most significant Communist countries, China and Vietnam, against each other, unites usually bitter enemies China and Taiwan, and is drawing the United States back to a partnership with Vietnam a generation after the fall of Saigon. The South China Sea is the flashpoint in the Pacific where conflict is most likely to break out through miscalculation. It is a crowded maritime environment contested by some inexperienced maritime forces with underdeveloped naval doctrine, among whom there are no established and accepted rules for managing maritime incidents. And the combination of the claimant states’ power asymmetries, overlapping prerogatives, and growing nationalism mean that incidents, once they occur, are likely to escalate. There are four reasons why finding solutions to the South China Sea disputes should be given the highest priority by strategic policy-makers. The South China Sea symbolises Beijing’s larger maritime dilemma. The country’s major population and productive centres cluster along China’s coastline, and are therefore vulnerable to major attack from the sea. Naval strategists see China as hemmed in along its sea coast by a chain of states or territories hostile to Beijing: Japan, Korea, the Ryuku Islands, Taiwan, and the Philippines. The overriding goal of Chinese naval strategy is to establish dominance over the waters within this ‘first island chain’. At the southern end of the first island chain, the South China Sea is crucial to China’s commercial shipping, energy flows, and the access of its Hainan island-based submarines to the Pacific. But the South China Sea’s southern and western access points – the Sunda, Lombok, Luzon and Malacca Straits – are controlled by allies or partners of the United States. The best way to offset this vulnerability is to control the South China Sea itself – and thereby loosen the American position in Southeast Asia. Influential elites in China view the South China Sea as ‘blue territory’ – that is, as much a part of China’s sovereign territory as Tibet, Xinjiang or Taiwan. To this line of thinking, any surrender of its claims in the South China Sea would signal a weakening of its rights to Tibet, Xinjiang or Taiwan – and is therefore unthinkable. China’s 1992 Territorial Law classified the South China Sea as China’s internal waters, meaning foreign naval vessels and aircraft must first gain Beijing’s permission before transiting, submarines must surface, and that China retains the right to evict other countries’ shipping at any time. Beijing’s willingness to enforce this law has been growing apace with its naval power in the western Pacific. In recent weeks, Beijing has placed the Spratly and Paracel Islands and the Macclesfield Bank under prefectural-level administration, established a 45-member legislature to administer the 1100 people who live on the islands, and approved the deployment of a People’s Liberation Army garrison to the islands. If unaddressed, the dynamics in the South China Sea could return Southeast Asia to the bad old days of inter-state divisions, domestic instability and competitive great-power interventions. On no other issue have the disagreements and rivalries between ASEAN member states been so sustained and obvious. The Philippines and Vietnam demand that the organisation supports them in standing up to Beijing. On the other side are Cambodia, Laos and Myanmar, with no direct stake in the conflict and which refuse to endorse the Philippines’ and Vietnam’s confrontational stance. Indonesia, Malaysia and Singapore are concerned about the dispute, but believe that avoiding confrontation with China will improve the prospects for productive negotiations. The stand-off over the South China Sea exposes the hollowness of Asian institutions’ reliance on the principle of unanimity – which means that any member’s objection can keep an issue, no matter how pressing, off the agenda. Beijing’s refusal to discuss the South China Sea in any regional meeting, and its implicit threat to withdraw from any organisation that doesn’t respect this wish, shows Southeast Asia’s confidence that it could ‘socialise’ China by welcoming it into regional institutions was misplaced. Asian institutions allow Beijing to make apparent concessions, such as its 2002 agreement with ASEAN to a Declaration of Conduct on the South China Sea, without actually surrendering any part of its position. As China and the United States increase the stakes in the South China Sea, ASEAN’s cardinal principle of neutrality is threatened. The Philippines, Vietnam, Malaysia, Singapore and Indonesia are tightening their strategic relationships with the United States, just as Cambodia, Laos and Thailand deepen their links to China. And there are signs that the disputes have become entangled in domestic politics in the Philippines and Vietnam, making their stances even more uncompromising. In Manila, following allegations that Beijing used corrupt payments to soften the former Arroyo administration’s stance on the South China Sea, the current Aquino administration and its Parliamentary opposition are vying for the most uncompromising policies on the issue. To counter rumours circulating around Hanoi that Beijing has ‘bought’ the Vietnam’s senior leadership, the Vietnamese government has passed a law claiming sovereignty over the Spratly and Paracel Islands. It is in the South China Sea that Southeast Asia’s anxieties about China overlap with American anxieties about Beijing’s naval buildup. Over the past two years, the United States has taken an active interest and position in what had formerly been a dispute between China and the other claimants. This means there are now in effect two layers to this dispute: a basic stand-off between the territorial claimants; and an overarching strategic contest between Beijing and Washington. For the United States, what’s at stake in the South China Sea is the viability of its entire presence in the western Pacific. The US Navy’s access to the South China Sea is contested by Beijing. China claims it will respect the freedom of passage of ships and aircraft through the area, on the condition that they are en route to another destination, and do not conduct military exercises or collect intelligence or militarily useful data. Washington is adamant that the South China Sea’s sea lanes are international waters, and are therefore subject to freedom of navigation, which in international law allows the conduct of military exercises and the collection of intelligence and militarily useful data. If Washington surrenders its ability to navigate the South China Sea on its own terms, it will lose a major foothold in the western Pacific. The South China Sea in effect pits a Chinese expansive claim (sovereignty based on historical usage) against an American expansive claim, that freedom of navigation allows the collection of intelligence and military data. The American claim is contested in other waters by Malaysia, Indonesia and India, though supported by other regional countries. China accuses the US of ‘hyping’ the freedom of navigation question, arguing that it hides an intention to use the issue to build a coalition against China. For the Southeast Asian states contesting China’s South China Sea claims, the United States’ presence and interest in the issue is a prerequisite for their position. Washington is acutely aware that it needs to be seen as a reliable ally and partner in the Pacific. It realises that its arms-length response to the Asian Financial Crisis eroded its position in Asia and set China on its path towards building soft power in the region. For Southeast Asians worried that Washington’s attention or will to stay in the region may erode, there is virtue in keeping the South China Sea on the agenda. But Washington can’t give its allies and partners a blank cheque which allows them to confront, and even provoke, China from the comfort of the assumption that the United States will back them up. And some in Southeast Asia are watching Washington’s moves very closely, sensitive that any concession could signal its acceptance of China’s claims in the South China Sea. Either multilateral mediation or international law is most often used to resolve disputes of this sort – but in the South China Sea they act to exacerbate the situation. Beijing refuses to discuss the dispute in any multilateral context, fearing that it will facilitate the formation of a front against China. The Southeast Asian claimants, however, are adamant that they must deal with China as a coalition, with Manila particularly insistent that ASEAN must negotiate a common position before negotiating with China. The result is a stand-off: the Philippines insists that ASEAN must find a common position before negotiating with China, while China will only negotiate if ASEAN abandons the search for a common position. International law also intensifies the dispute. The United Nations Convention on the Law of the Sea does not recognise China’s historical claims, and therefore cannot serve as the basis for an adjudication of the dispute. Worse, because international law relies on unbroken longevity of claims as the basis for adjudication, none of the parties to the South China Sea dispute can allow others’ claims to pass uncontested, in case this is taken as evidence of its relinquishing of its claim. The result is a steady drum beat of hydrocarbon prospecting, fishing, the occupation of islets, and maritime clashes. There is a great deal at stake in the South China Sea. The dynamics of this issue will impact on China’s evolving international personality, the response of its neighbours to its rising power, and the longevity of the United States’ position in the western Pacific. With the growth of trade and investment around Asia’s Indo-Pacific coast, the South China Sea will become ever more crowded with shipping and commerce. None of the options for managing and resolving the competition currently on the table have any chance of working, and so new initiatives must be found. While Australia has no direct interest in the territorial disputes, it should be extremely concerned about the prospects for the disruption of its own trade flows within the region, and more broadly about the possible impacts on the strategic balance in the Pacific. Canberra is not a party to the dispute nor a great power, and therefore is well placed to play a significant role in proposing and brokering a solution. Rory Medcalf and Raoul Heinrichs with Justin Jones, Crisis and confidence: major powers and maritime security in Indo-Pacific Asia, Sydney, Lowy Institute for International Policy, 2011, pp 24-5. Toshi Yoshihara and James R. Holmes, Red star over the Pacific: China’s rise and the challenge to US maritime strategy, Annapolis, Naval Institute Press, 2010, pp 51-3. Peter Dutton, Three disputes and three objectives: China and the South China Sea, Naval War College Review, 64 (4) Autumn 2011, pp 54-5. Alice D. Ba, Staking claims and making waves in the South China Sea: how troubled are the waters?, Contemporary Southeast Asia, 33 (3) 2011, p 282.